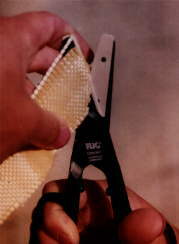 No-one told this scissor that Kevlar is hard to cut! Some modern yarns are so hard and strong that steel scissor edges are quickly blunted by the high forces needed to pierce and shear the yarn fibres. Ceramic materials are much harder than hardened steel and are much stronger than steel in compression. As a result, a sharp ceramic scissor blade will pierce the yarn easily and will not be blunted by the force of entering and shearing it. These featherlight scissors with Zirconia ceramic blades made of top quality 3-axis diamond ground German ceramic are ideal for cutting Kevlar and Spectra yarns and woven or knitted products made from them. They will give you a lifetime of use and a perfect cutting action from day one. - But don't try them out on emery cloth, glass-fibre or steel wire - there's some things even these blades won't like! Price: �55 + VAT per scissor. Discount for 5+ scissors. For Info in more depth on Flig Ceramic Scissors click the link.